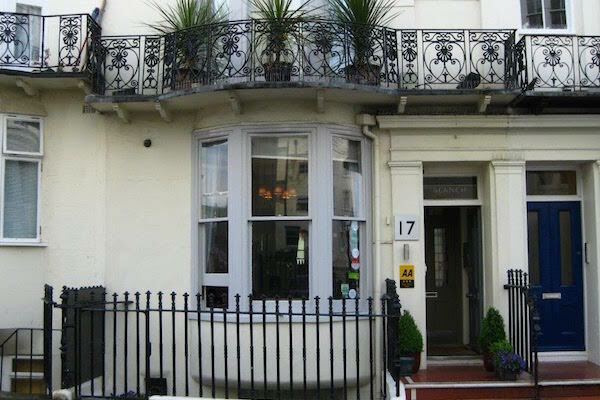 Blanch House is a hugely popular boutique Hotel located in quirky, fashionable Kemptown, a stone’s throw from the seafront and a short walk from Brighton city centre. This AA 3 Star Town House Hotel is owned by Kerry Turner and Jeremy Ornellas who clearly have the right idea as it was named as TripAdvisor certificate of excellence winner for 2015. 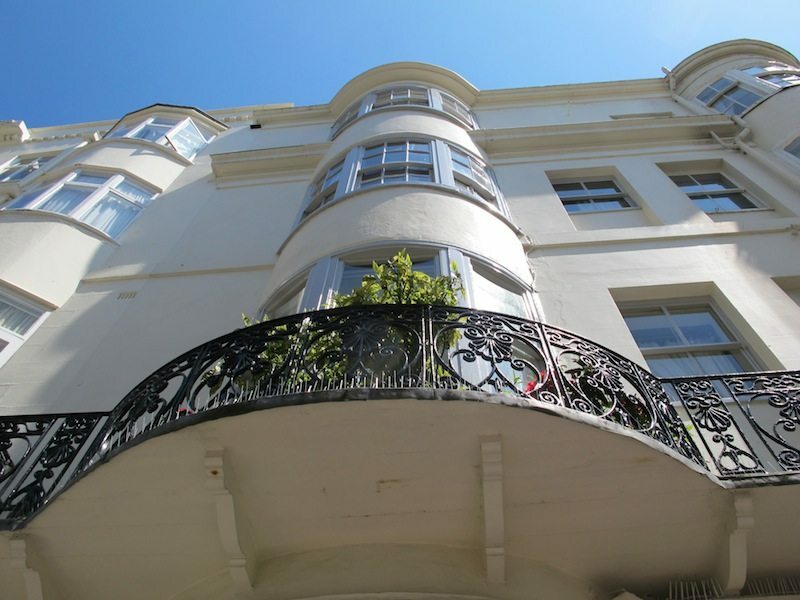 It is a beautiful Grade II Listed Regency Town House and boasts 12 sumptuous, individually designed rooms, as well as a fabulous champagne and cocktail bar. Exclusive hire is available for events and special occasions and their Belle Epoque Suite is fully licensed for weddings and civil partnerships. The kitchen is run by Chef Sean Dickens and uses local, free-range produce wherever possible. Assistant manager Josie made us feel exceptionally welcome when we arrived and looked after us impeccably throughout our visit. 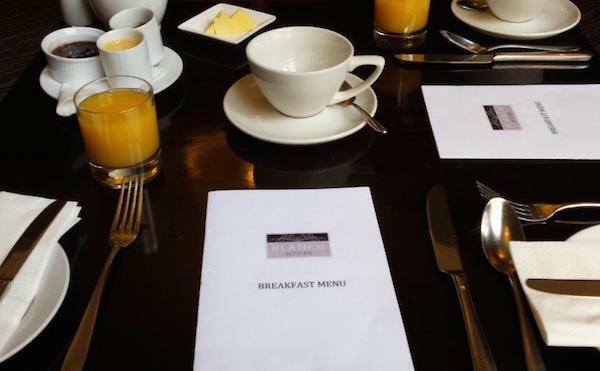 My husband and I were there to sample Blanch House’s award-winning breakfast. We were led into their grand, spacious dining room, with it’s high ceiling, sage green walls and lovely, almost Picasso-esque artwork. The tables were well-spaced and very clean and there were pretty flowers dotted about the room. The music was a mix of soothing and subtly invigorating tracks, perfect for those of us who need to be gently eased into consciousness in the morning. We were quickly brought some excellent tea and coffee, which was sorely needed after an early start and we helped ourselves to copious quantities of good quality fresh orange juice. Having settled in we ordered a round of toast and went to survey the breakfast buffet. 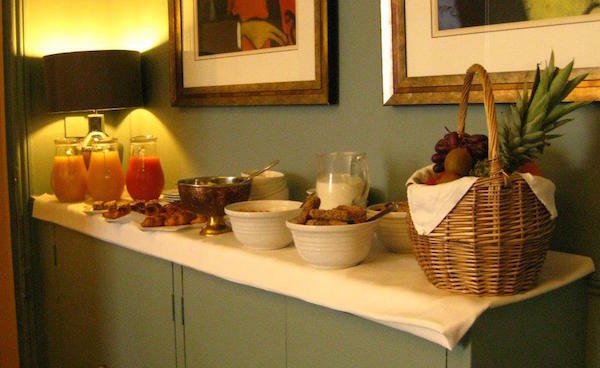 There was a beautiful basket of fruit as well as fruit salad, home-made granola bars, croissants and cereal and three different types of fruit juice. Andrew had a golden, buttery croissant and I tried a granola bar. It was really yummy, sweet and amazingly soft, chewy with fruit and crunchy with nuts. When the toast arrived I enjoyed it simply with butter but Andrew was intent on making the most of the gorgeous selection of home-made condiments. 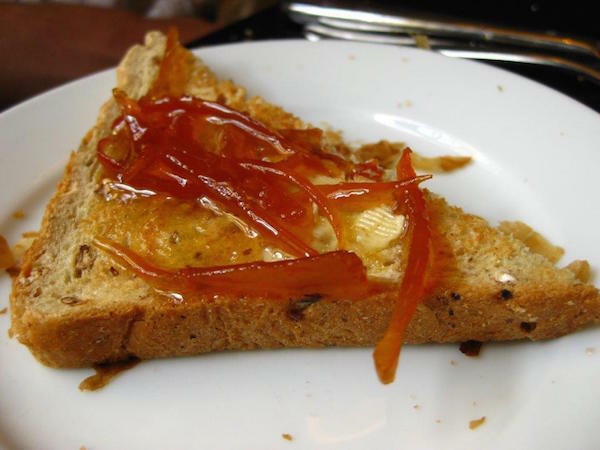 He lathered his toast in first a rich, fruity strawberry jam, then a delightfully light, zingy lemon curd, and finally a stunning marmalade with a powerful, bitter sweet hit of oranges. Having grazed for far longer than we really should have (it’s so hard not to enjoy a little bit of everything on offer when it all looks so good!) we ordered our “main” breakfasts. We had intended to have different breakfasts so that we could showcase the greatest variety of dishes possible but when it came to the crunch there was nothing else for it, we both *had* to have the Full English. If I had been staying there for a few days I absolutely would have worked my way through the whole delicious-sounding menu, which included a vegetarian Full English, scotch pancakes (with or without crispy bacon), smoked salmon with scrambled eggs or just eggs and toast, and yes, you can have boiled eggs with soldiers if you’d like. However, we only had one chance, so Full English’s all round it was! 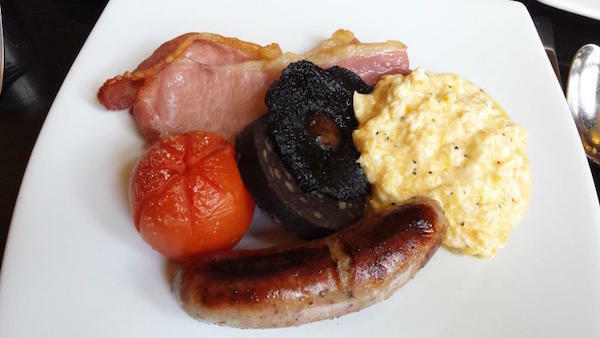 They came with a juicy, whole, oven-roasted tomato, a lovely, succulent, flat mushroom, two rashers of properly thick, meaty bacon, a huge, delicious ‘butcher’s choice’ sausage, two eggs cooked to your liking and a seriously hefty slice of rich, earthy black pudding. Andrew had his eggs scrambled and they were moist and very tasty. I had mine perfectly fried, with luscious runny yolks. It was a seriously hearty breakfast and incredibly filling. We definitely had to sit and digest for a bit before heading off but there was not the slightest suggestion of being rushed. When we did leave, we were still utterly stuffed and there was no doubt we were properly set up to deal with whatever the day ahead might throw at us. 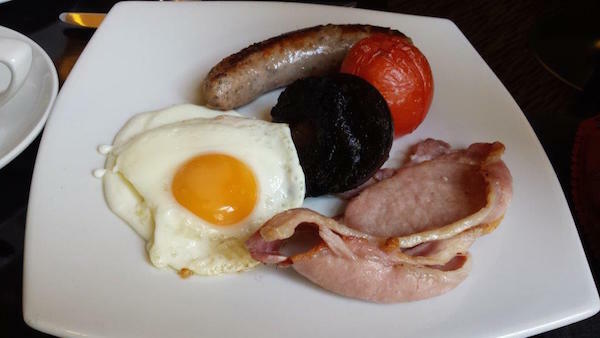 Breakfast will set you back £15.95 for non-residents but is included for guests.